Is your garage more storage space than parking space? Are tools, extension cords, holiday decorations and ladders taking over? 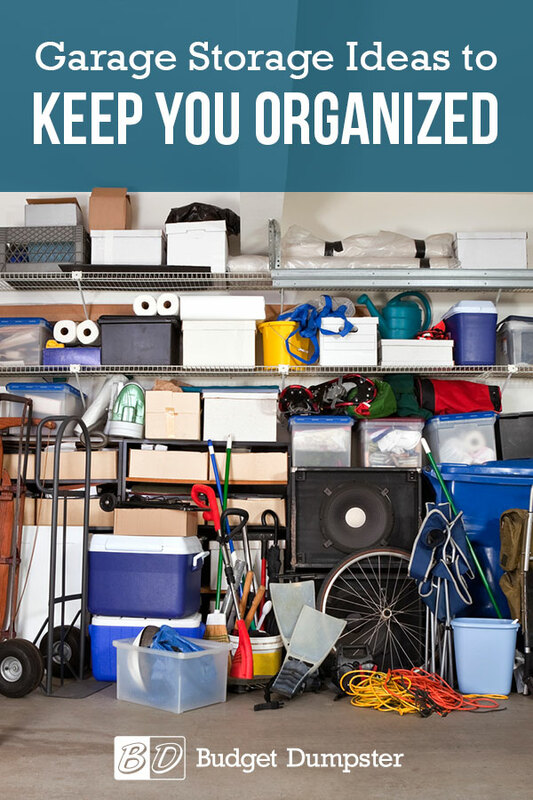 You need to clean, organize and add plenty of storage to take back your garage. For inexpensive solutions to your clutter conundrum, use these DIY ideas to create garage organization on a budget. Choose the project that’s right for your needs, budget and DIY skills. 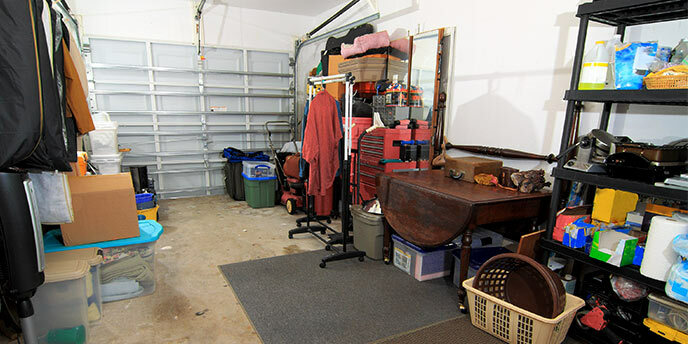 The best way to keep your garage organized is to keep items off the floor whenever possible. Custom garage built-ins can cost thousands of dollars, but building your own shelving is a quick way to improve garage organization on a budget. Open shelving in the garage allows you to easily see and access your items while keeping them out of the way of people and cars. These plans from DIY blogger Ana White provide directions for building a 20-foot long garage shelving unit that is just what you need to get all those bins and boxes off your garage floor. The size of the unit can also be adjusted to fit any garage wall. 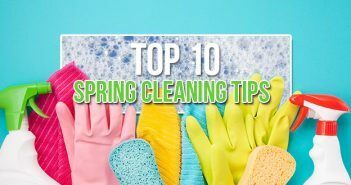 Before you begin adding storage, take some time to get rid of junk and thoroughly clean out your garage so you can begin organizing on a clean slate. Nonnahs Driskill | Get Organized Already! Inc. If you want to hide your clutter as well as get it off the floor, you can choose garage cabinets instead of shelving. One potential blueprint you can follow comes from The Family Handyman Magazine, featuring 80 cubic feet of storage and sliding plywood doors. The instructions are easy to follow, and the project itself should only take you a day to finish. Before you mount your cabinets to the wall, account for where you will park your car. Mounting them on the wall opposite your garage door should give you plenty of wiggle room. Are cabinets or shelves better for the garage? If you have exposed studs in your garage, a pegboard wall is a simple organization tool that’s also super easy to install. Pegboards are perfect for exposed studs because they require a small void behind them to attach hooks and baskets. Don’t have exposed studs? No problem. You can simply build a frame onto the back of your pegboard such as the one in this guide by the Sawdust Sisters. Pegboard is completely customizable and is one of the cheapest garage storage ideas, though you do need to save some of your budget for hooks, baskets and other hardware to hang on the board. You probably have more free space in your garage than you realize. You just need to look up, and take advantage of ceiling space to keep your garage organized. This budget project transforms useless ceiling space into a storage solution. Depending on the height of your garage, you may even be able to install shelving above your garage door, like in this project example by Her Tool Belt. 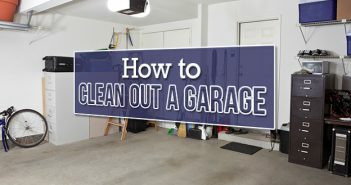 At a low cost, this is a great project to improve garage organization on a budget. Similar to a pegboard storage system, a slatwall allows you to hang items on the walls with moveable hooks. Slatwalls are sturdier than pegboard and can hold heavier items, making it slightly more expensive. This storage solution can be installed on drywall or exposed studs. Hooks, baskets, shelves and other accessories can all be added to meet your garage needs. You can even add garage shelving to a slatwall to create more storage options. DIY garage shelving and cabinets will help you keep clutter off the floor of your garage, but what about the items you use on a daily basis? Create zones by grouping like items together in your garage with these ideas for storing tools, extension cords, bikes and ladders. Never trip over a rouge bike or waste time digging for a wrench again. 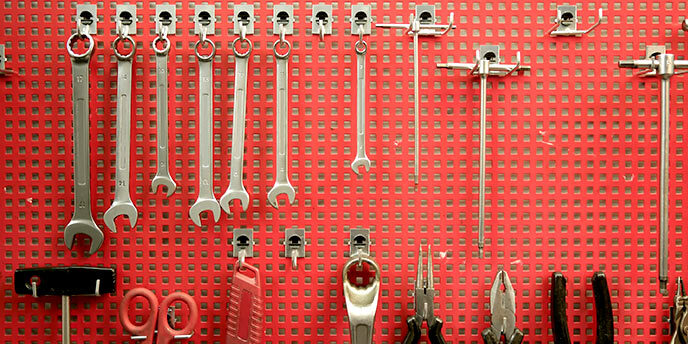 Dedicate a section of pegboard to tools. Build a portable tool caddy. Extension cords are necessary and hard to control. When storing them, you want to ensure your cords remain untangled and readily accessible. Build DIY extension cord racks. Install wall hooks and arrange cords by length. Hang coiled cords from a wall-mounted towel rack. Ladders are large and can easily get in the way of your car when left on the garage floor. If you have more than one ladder, a storage solution is absolutely necessary. Building a ceiling storage rack. Hanging ladder horizontally on the wall using dedicated wall hooks. Saving wall space by hanging ladder hooks from your garage door track. Building a DIY bicycle rack. Using paint or tape to create a bike parking zone in the garage. Hanging bikes from ceiling joists using scrap wood and bike hooks. Installing wall hooks and store bikes horizontally or vertically as space allows. Once you’ve selected the storage solution that’s right for you, you’re only a few days away from an organized, useable garage. With these cheap garage storage ideas, you can guarantee it stays clean longer than just a few minutes. Looking for More Garage Ideas on a Budget? I use pallet racking as workbenches and I have found that I am really wasting the space under the benches. There is no organization system under the there and it has become wasted space in which I could store things that are currently out in the middle of the floor. It hasn’t really been a huge issue yet due to the size of the shop, 40′ x 60′, but I am going to address it before the issue gets worse.